Cambodia is bordered by neighbouring Laos, Thailand, and Vietnam, and makes a great destination to visit on its own, or as a longer tour to include other countries within Indochina. The temples of Angkor are Cambodia most famous attraction, but there is so much more to discover, including Phnom Penh's Royal Palaces, and the beaches and islands of Sihanoukville. Price for Private Tour: From $580 per person + Internal Flight - low season (based on 2 adults sharing 3 Star accommodation). 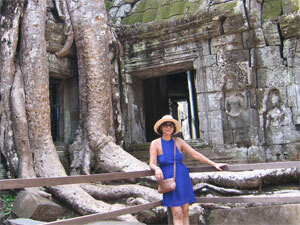 A Private Tour visiting Siem Reap, Kampong Cham, Phnom Penh, & Sihanoukville. Price for Private Tour: From $1280 per person - low season (based on 2 adults sharing 3 Star accommodation).